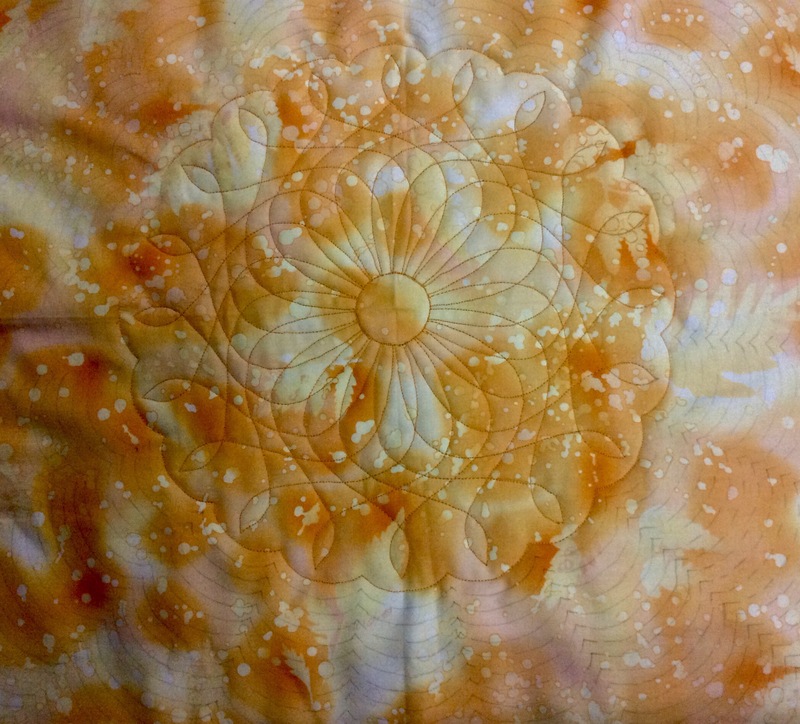 My Dreamcatcher quilt is being quilted in 5 panels, four of which are 4 blocks put together and the centre piece is a plain square. You can see what I mean here. I had been wondering what I was going to do in the centre square – browsed through several pins on Pinterest and googled through hundreds of images. And then, suddenly, the answer landed up in my email inbox last month! 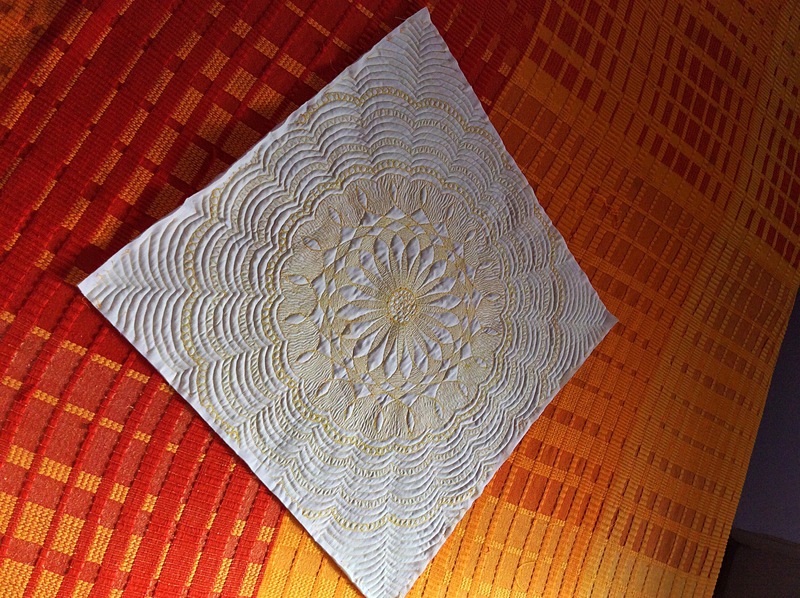 I have been an admirer of Geta Grama, the Romanian quilter, ever since I took up quilting some 8 years ago. She does the most fantastic FMQ and her trapunto is to die for! You will fall in love with her gorgeous patterns. Well, to cut a long story short, she has designed a whole cloth quilt pattern (Endless Love) and…believe you me…it has been quilted on Fossil Fern (by Benartex) fabric which I am using for my quilt – even the colour of the fabric is exactly the same blue I have there in the centre of my quilt! Now if that is not serendipity, what is?! There were two patterns in the package I bought ( with excellent, detailed instructions) and I decided to try out the simpler one on a practice piece, before I start working on the blue fabric. 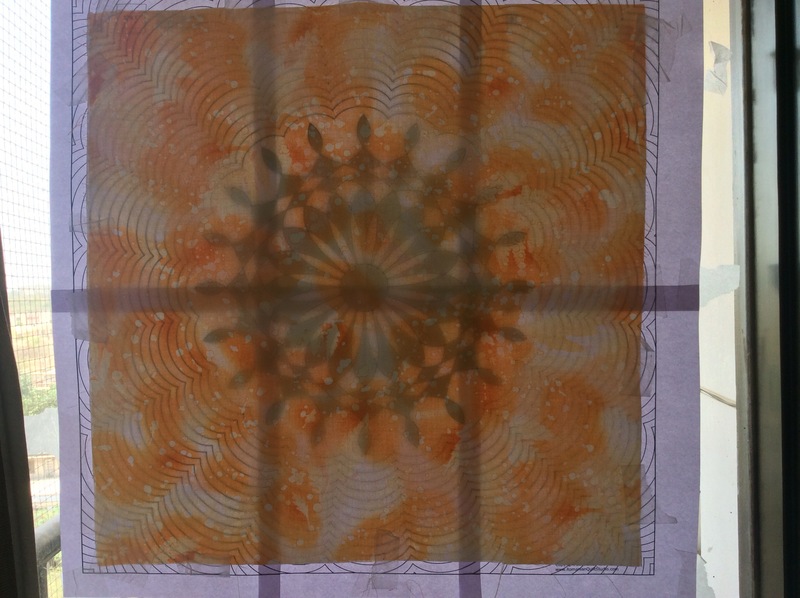 I taped the printed paper pattern to a sunlit window; taped the fabric square on it and traced the pattern with a pencil. 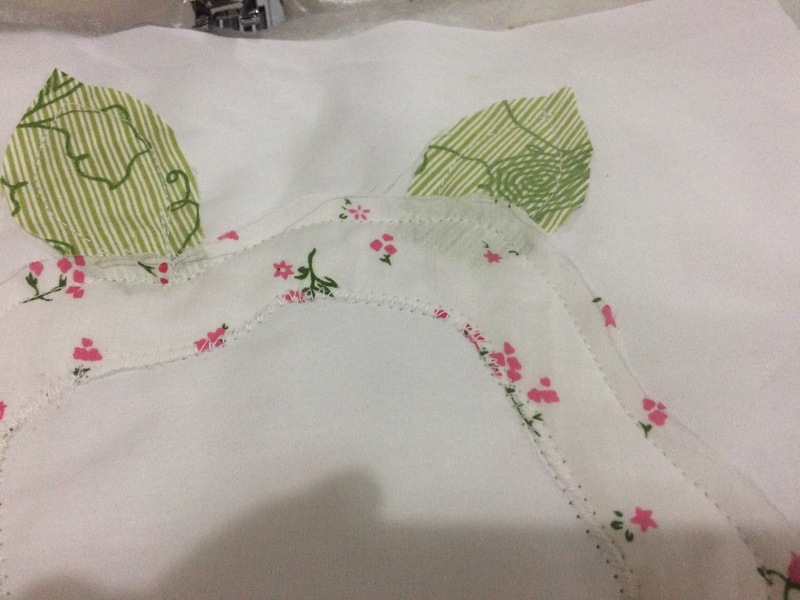 It took me almost two hours to do this, beginning from starching and pressing the fabric to finish tracing it. Extremely tedious! 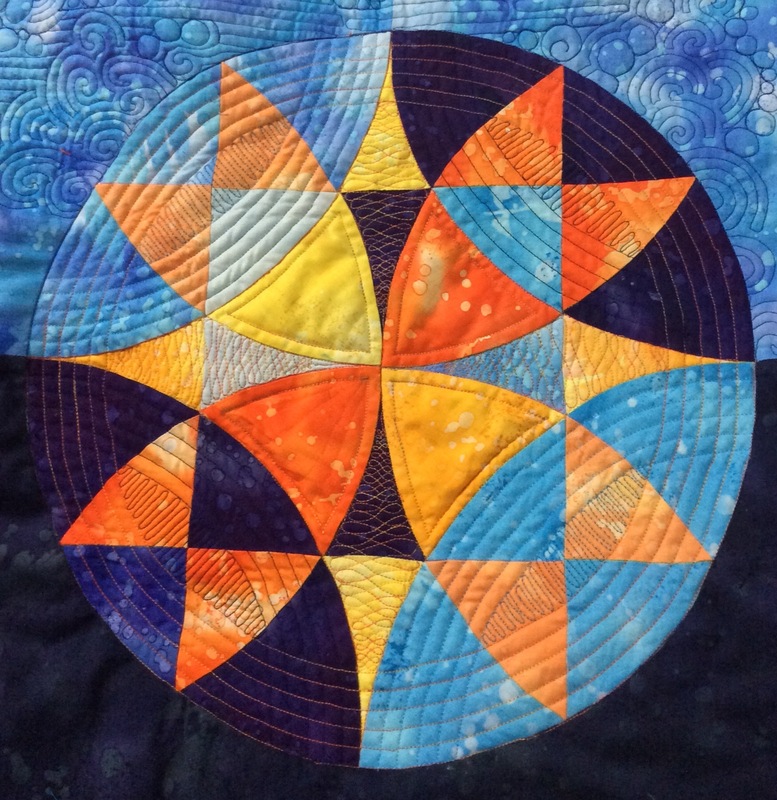 I used the embroidery foot R of the Husqvarna Viking Topaz 20 to quilt the rosette. The pattern is so designed that you can quilt it in one continuous go – without having to lift the foot. It was surprisingly easy. I think it took me less time to quilt it than trace it! I was not very happy with the uneven stitch length and opted for the regular foot B to do the scallops. 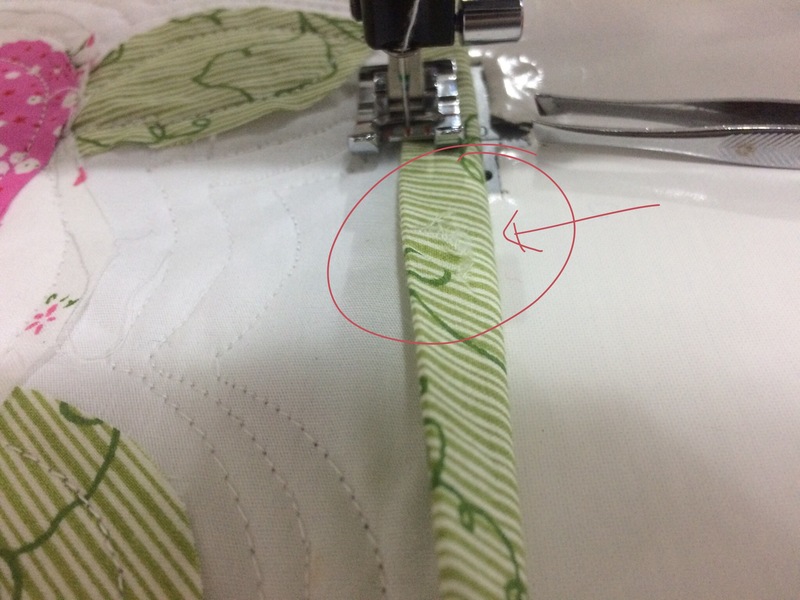 I really love the fact that I could just snap off the R foot and put in the B foot, changed the machine setting from Fmq to regular and I was ready to go! I have to admit was much slower going than the free motion quilting, but the results were quite worth the one and a half hours I took over them! 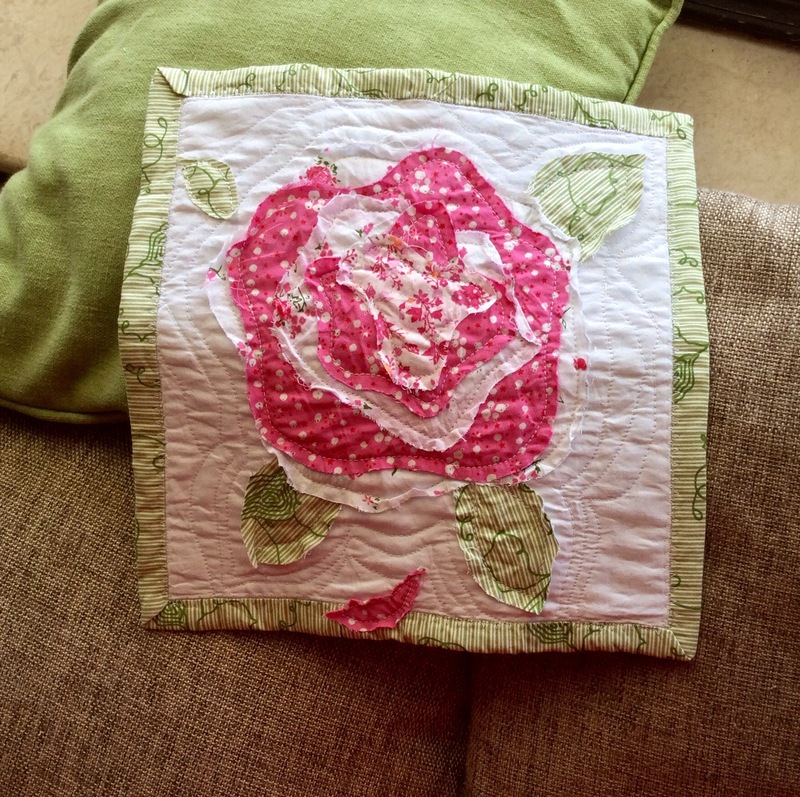 In fact the designer says the entire piece can be quilted using a walking foot! I am going to do that for the blue fabric. 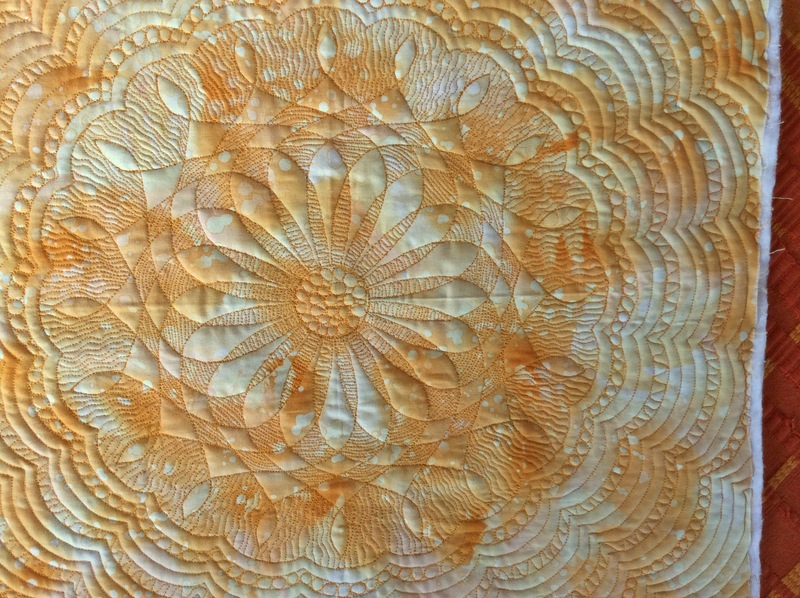 The outer scallops were quilted with the regular B foot in my Hasina! 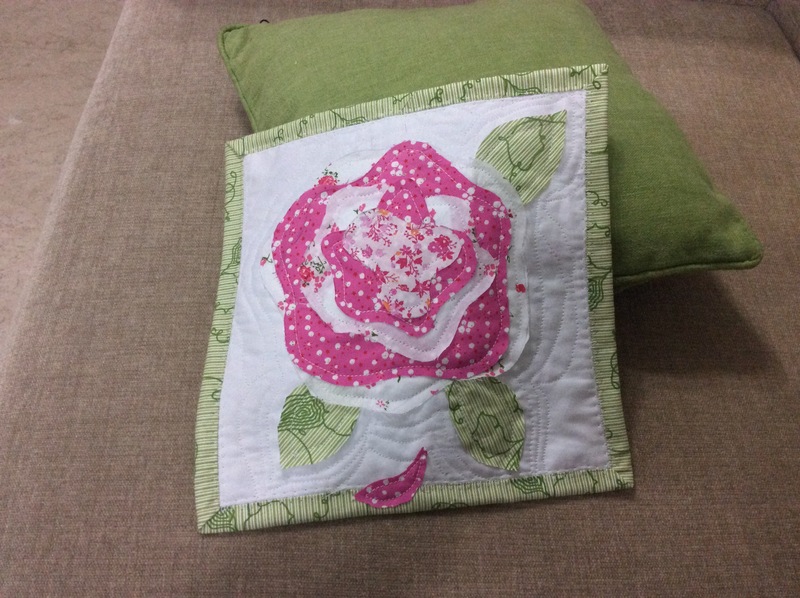 As suggested by the designer, I added some more fmq to the pattern to make the rosette and scallops stand out. Here is the final result! 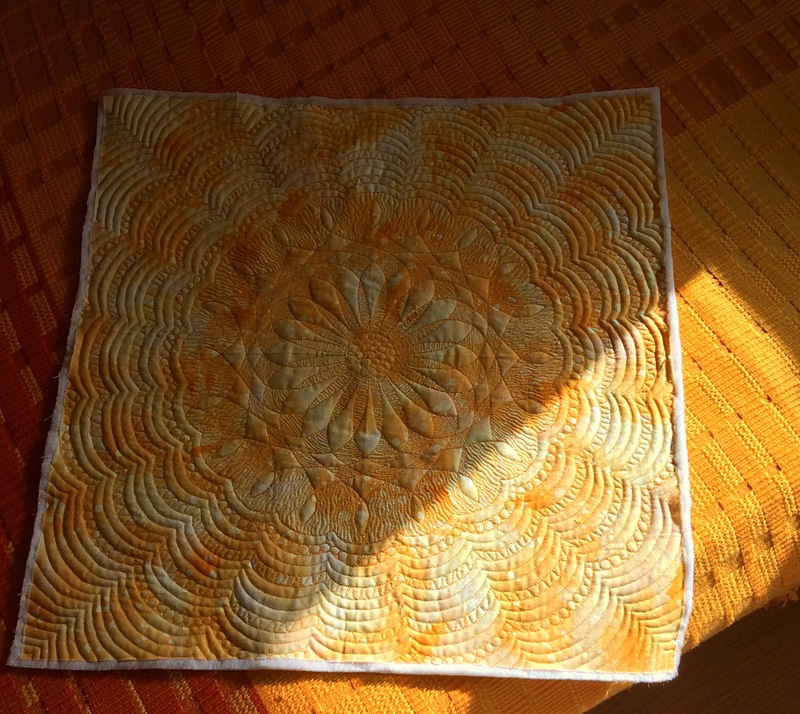 The rays of the setting sun show off the quilting! A couple of views of the back…but before that, tell me what you do when you look at the back and discover that the tension had gone off suddenly in a couple of places? Do you rip that and re-do it? I had a couple of such areas! Thankfully they were near the edge and will be hidden under the binding. At the end of this exercise, I feel confident of being able to tackle the centre. If only, but only, someone would offer to trace out the pattern for me…sigh! 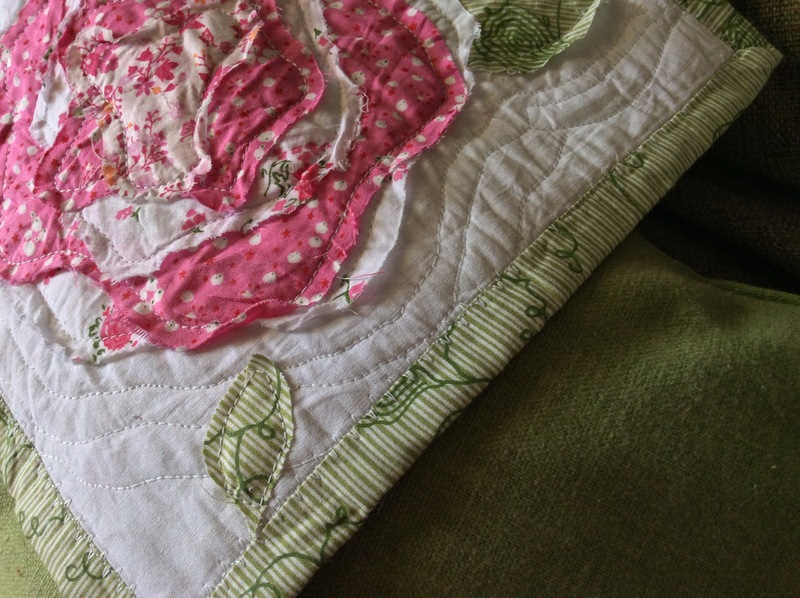 …which leaves me with a 9″ border in a 100″ square quilt yet to be tackled. My calculator tells me that is 3276 square inches to be done. Am dreading it because it is on dark fabric and I shall not really be able to see what I am doing if I quilt with dark thread as I was planning to! 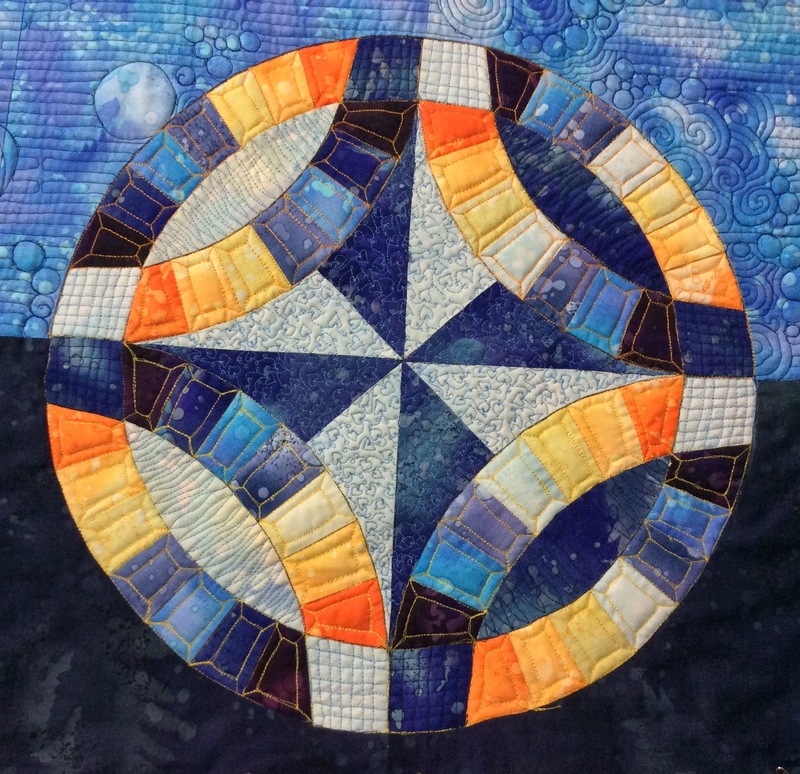 Author MadsPosted on June 13, 2016 Categories Patchwork of my life, Round the Year quiltTags Double Wedding Ring Quilt Block, fmq, quilted hearts6 Comments on The Final Block! Winding My Way Through the Last But One! Does anything need to be done in the centre? 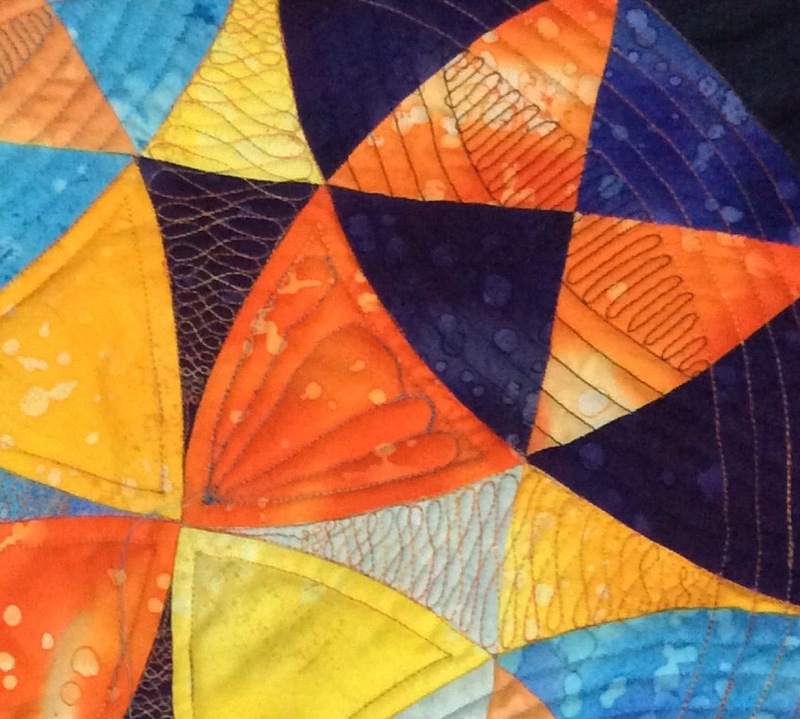 I used the walking foot to quilt those lines. I did venture on some feathers for the four ‘petals’ but with disastrous results. Is that ugly, or what! ?! Why, just why, can I not wrap my brain around feathers? Actually, I don’t think God intends me to quilt them, so I shall stay away from them henceforth. The last block is the double wedding ring and then I start working on the dark blue ‘border’. 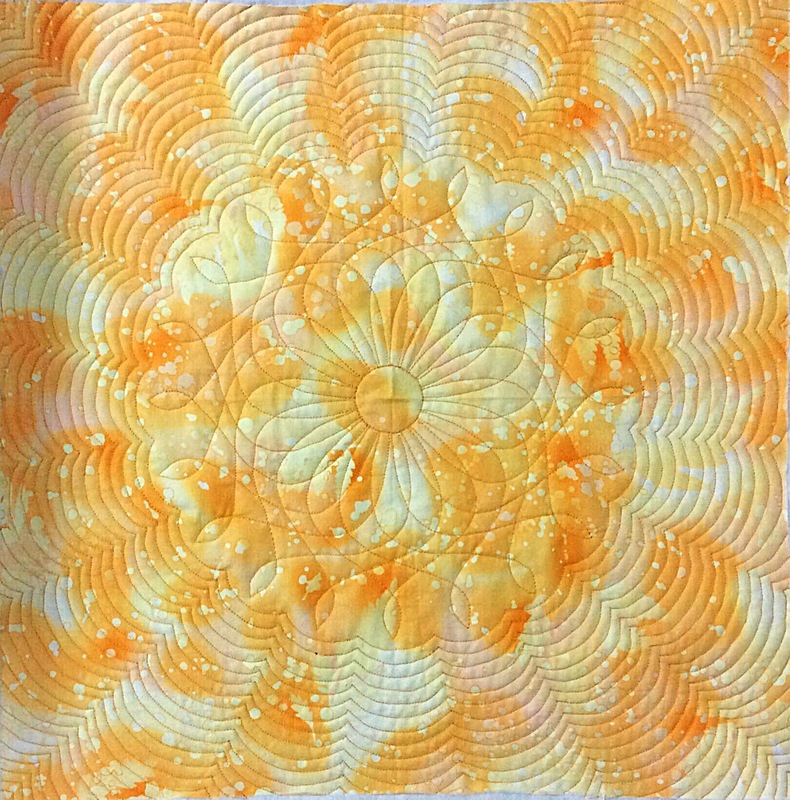 Author MadsPosted on June 9, 2016 Categories Patchwork of my life, Round the Year quiltTags Free Motion Quiling, Winding Ways Wheel quilt block2 Comments on Winding My Way Through the Last But One! I have been gathering some Kaffe Fasset fabrics and scrolling Pinterest and the Internet for a suitable pattern to showcase the gorgeousness. 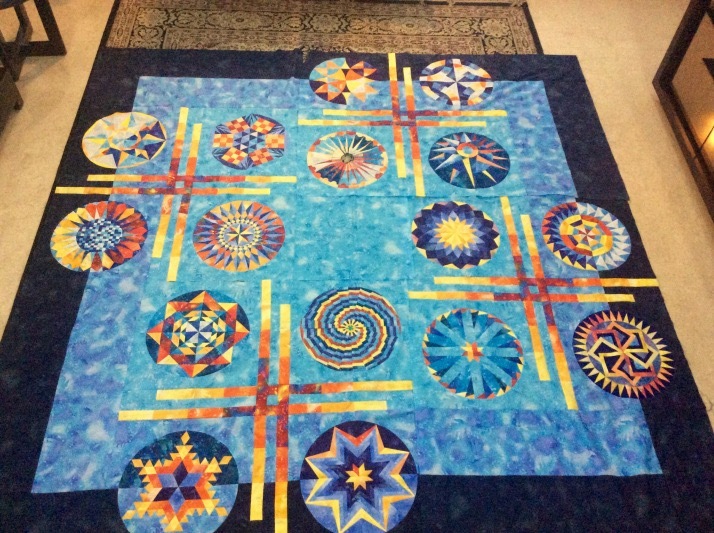 And then, a few weeks a beautiful quilt showed up on my Pinterest! 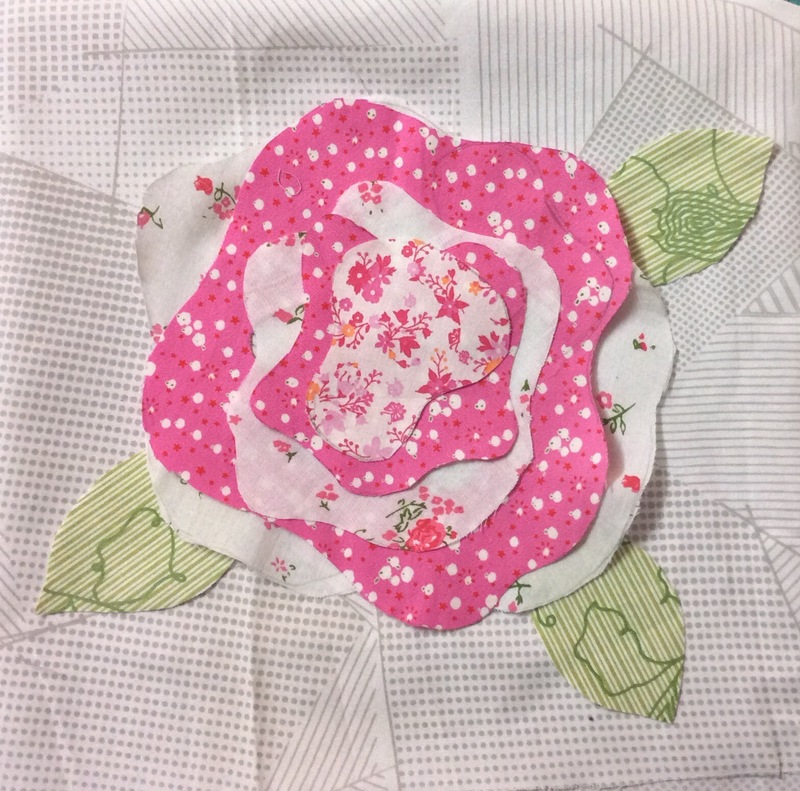 The French Rose quilt pattern by Heather French was used to make a delicious quilt in Fasset fabrics. I wanted that for my daughter. The pattern is available on Amazon, but not in downloadable format nor do they ship to India! 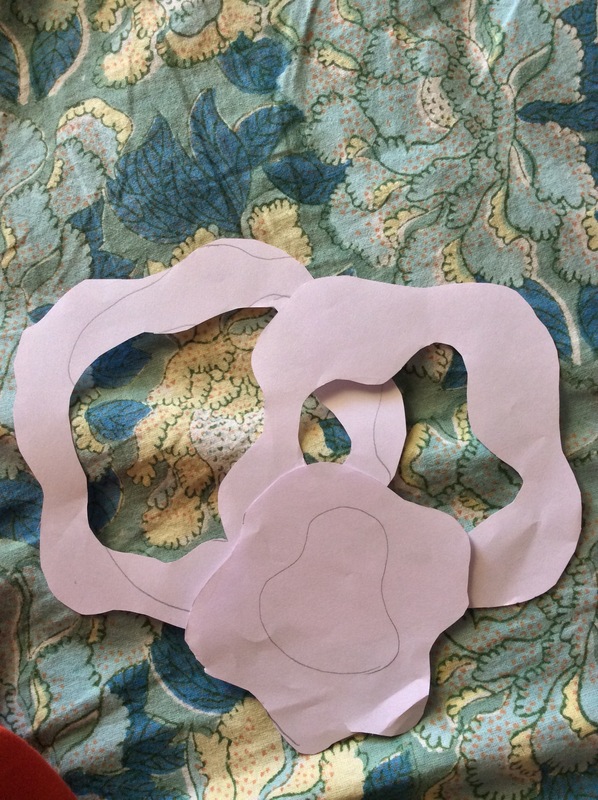 Needing instant gratification, I had to draft my own pattern. The Rose is about 6″ on a 10″ square. I made a sandwich with the batting and backing and straight stitched 1/4″ inside from the outer edge, using a walking foot. I zigzagged the inner edge, just to secure the ring better. 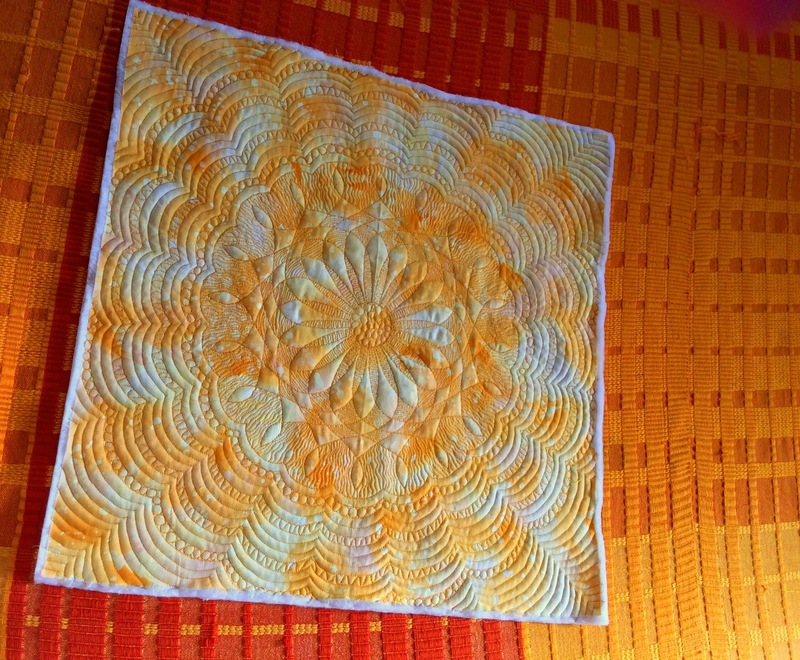 In no time I was done with the flower and did some echo quilting around it. 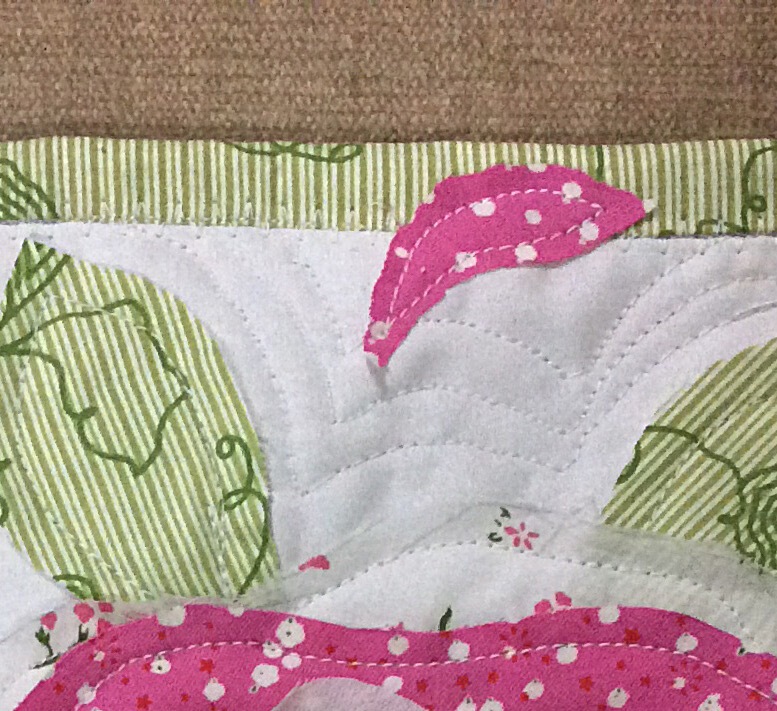 I trimmed it down to 9″ so that one width of the green fabric would suffice for the binding. But look at what I discovered as I reached the last edge of my binding! Discovered a tear on the binding! There was a tear in the binding fabric! This is how I got around that! A petal stuck on the binding to hide the tear! And so we were done. I soaked it in water overnight to fray the edges, but…we were not yet done! Discovered this the next morning! A stain that wouldn’t go away. Simple enough to handle, right? Just stick a leaf on top! 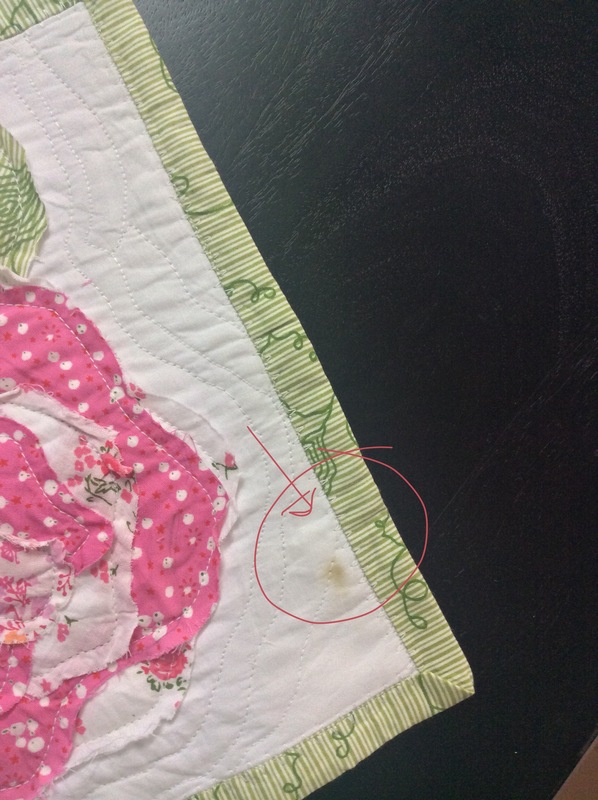 A ‘falling’ leaf hides a stain in the little quilt! 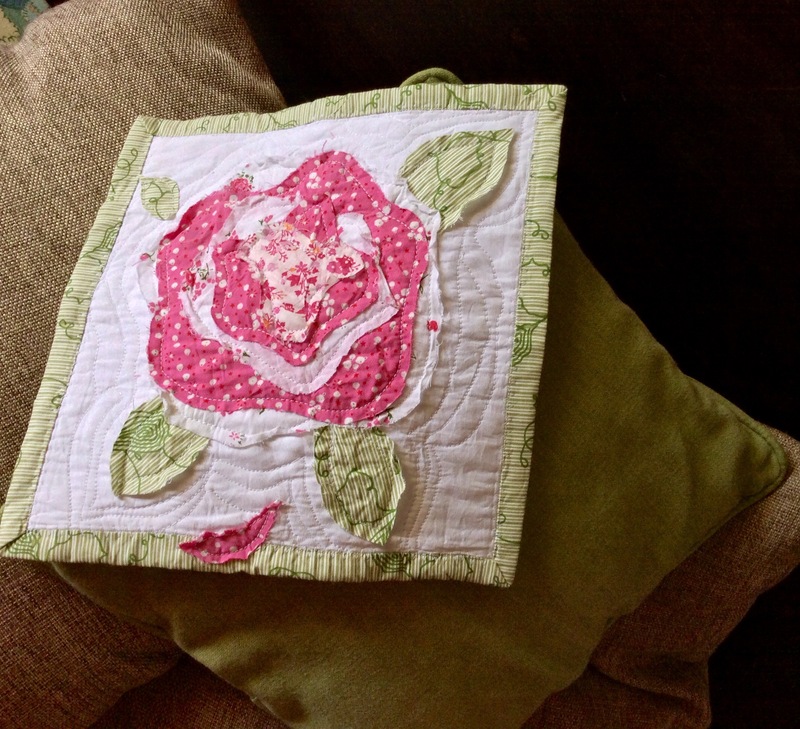 So here it is, my little French Rose quilt – with falling leaf and petal! Sweet, isn’t it? 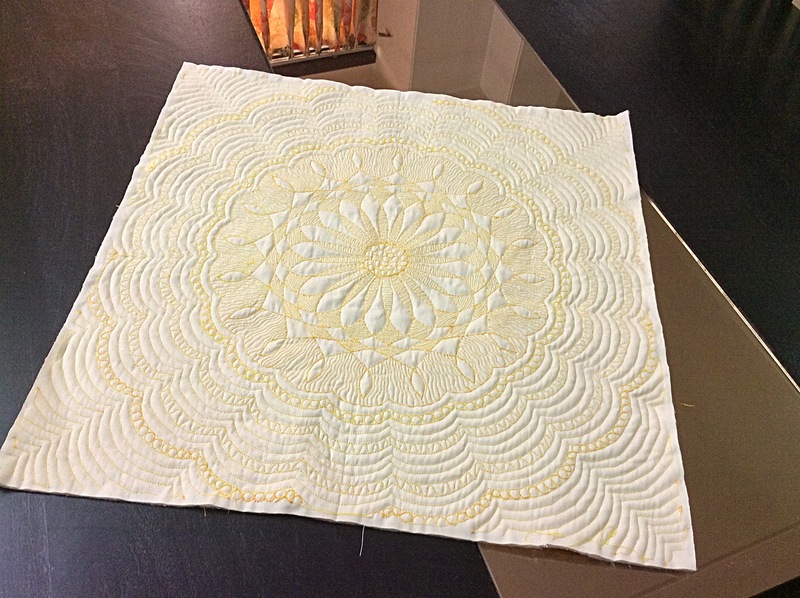 Can’t wait to get the Dreamcatcher quilt over and done with so that I can start on this one.